This morning we awoke to a blustery day on deck meaning our plans of chilling by the pool on todays sea day were not looking good. We made a brave attempt at sitting by the pool with blankets in a bid to catch the rays during the moments the wind dropped. And when it did drop it was beautifully warm, but these moments were rare and we soon ditched our valiant attempt in favour of watching a movie in the cabin and then Chris and Joe spending an hour playing Xbox Olympics and football. 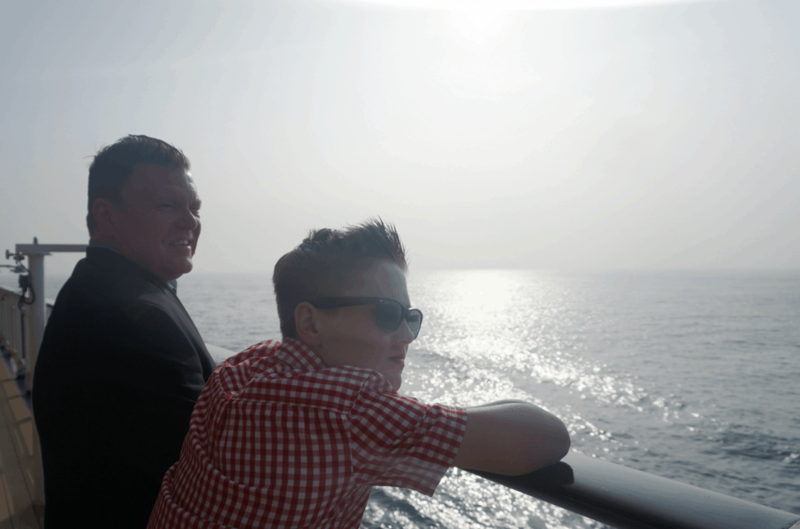 As much as we had planned a morning by the pool it was nice to hang out on the inside decks the ship. 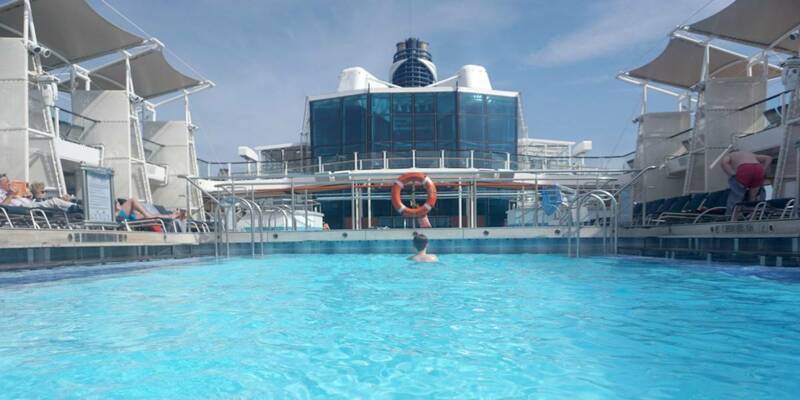 Cruise lines are well equipped for such days and the ship was buzzing with all the shops hosting sales and the bars and lounges offering an array acts to enjoy over a cup of frothy cappuccino. Being sun seekers we naturally radiate to the outdoors when there are blue skies. However the blustery weather gave us the chance to do something different. 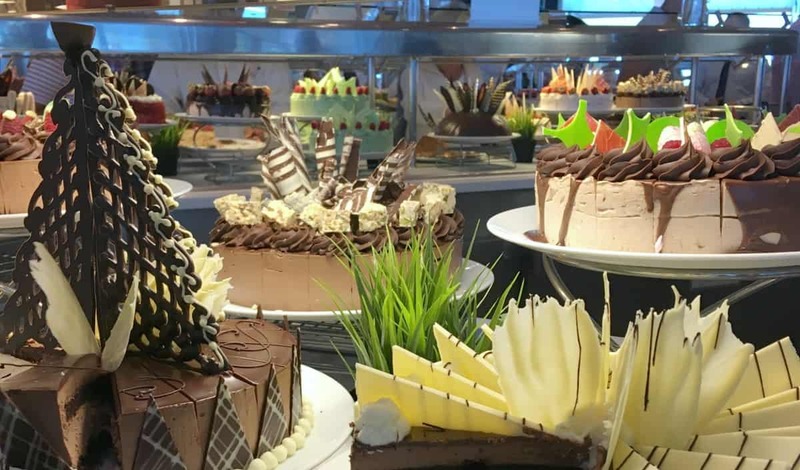 It is also a great opportunity to head to the Ocean View Cafe for cake. Fortunately for us the weather did pick up in the afternoon so after lunch we head to the pool so Joe could spend an afternoon dipping in an out of the water and eating ice cream, making the absolute most of our last full sea day and also giving me the chance to sit and read a book. It’s so much easier to get the opportunity to read as kids get older, I remember when they were toddlers it was near impossible to relax. The fact that there were no kids onboard meant Joe has been happy to hang out with us, no doubt if we had competition in the form of a kids club brimming with activity we would not have had these wonderful family days. Our evening meal was another opportunity to try new things with Joe enjoying lobster, something he has never wanted to try before and he loved it. I have to say even though my beef Wellington was amazing I was jealous of his lobster it looked to good. Dining is a real high point of cruising, so much so I think its hard to get food as good on a land based holiday. The service is always exceptional, our wine glasses have not been empty. After dinner we checked out the sunset( one of my favourite parts of cruising) head to the Margarita Bar for cocktails and a game of uno as we listened to the Stomping Ivories last show. What we intended being an early night ended up being quite a late one. But the entertainment has been so wonderful onboard you just don’t want to miss any. I can’t believe tomorrow is our last day? We have had so much fun, this week has flown and it just goes to show that you don’t need all the kids facilities on board to have an amazing time. Don’t get me wrong, we love all the family friendly facilities that cruising usually offers. However it not being there has not ruined our week one bit we have still had a great time. See what we got up to on day 5 here. Now read day 7 of the Bravo Cruise. Previous Post What’s New on the Independence of the Seas?